Exposure to space radiation on long-term interplanetary voyages could threaten astronauts’ health and thwart manned missions. how to keep astronauts safe in future NASA missions. [Credit: Casey Reed, NASA]. The hundreds of thousands of survivors of the atomic bombings in Hiroshima and Nagasaki continue to face a serious safety threat: the biological aftermath from high levels of gamma rays. Few environments have posed such a high risk of radiation exposure as during those final days in World War II. But outer space could be one, and astronauts would be the first to find out. While NASA is talking about manned space missions as long as six months to the moon and 38 months to Mars, scientists worry that the threat of health problems like cancer could climb with the astronauts’ exposure to cosmic radiation. Heavy particles hurtle through the seemingly empty space at almost the speed of light, creating a cosmic backdrop of radiation. 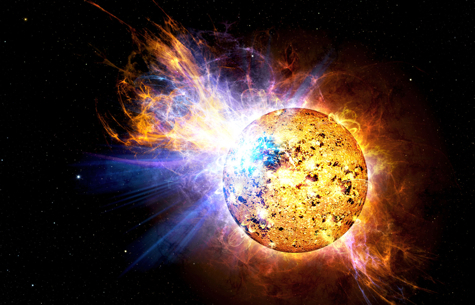 Stealing energy from dying stars, black holes and sun storms, these heavy particles are far more dangerous than gamma rays and other forms of terrestrial radiation. One study recently detected damage to astronauts’ DNA following six-month trips to the International Space Station in low Earth orbit, leaving scientists to wonder about the consequences of trips outside of Earth’s magnetic belt and outer atmosphere—natural shields against space radiation. To understand the link between radiation-induced DNA damage and the risk of developing cancer, NASA researchers are piecing together terrestrial data from mice and men. In the face of current health concerns, the agency has put a cap on cancer risk. NASA will not send astronauts on a mission unless it estimates that, compared to staying on Earth, the astronauts do not face greater than a three percent increased lifetime risk of dying of cancer. This risk is three times higher than the one-in-100 limit they deem acceptable for a mission failure like the Challenger or Columbia disasters. The difference is time, according to Francis Cucinotta, chief scientist for NASA’s Space Radiation Program based at the Johnson Space Center in Houston. Whereas a mission disaster would mean immediate death, astronauts who endure high levels of radiation damage could live for many years before succumbing to cancer-related illness. Cancer is a disease caused by DNA damage, and all radiation can assault DNA. The high-speed heavy particles in space radiation are a greater threat because they are more energetic and penetrating than X-rays, such as those used in tumor radiation therapy. X-rays and gamma rays strike DNA like low-caliber pellets, leaving minor insults that the cell can usually patch up, but the atomic bullets in outer space could fray and even rip the rope-like chords of DNA in ways that are difficult for the cell to repair. “There are types of damages that heavy [atoms] can do to the DNA that X-rays can never do,” says Cucinotta. One of the worst types of damage is a concentration of rips that accumulate in one region of the DNA, leaving it shredded like a paper target after shooting practice. This damage carries “an enormously high risk of cancer,” says Sandeep Burma, a molecular biologist who studies DNA damage at the University of Texas Southwestern Medical Center in Dallas. Although damage left unrepaired usually triggers a self-destruct cascade in most cells, a rare cell can survive and pass faulty genetic information on to its daughter cells. This chance increases with increased radiation exposure. As NASA tries to gauge the safety of interplanetary travel, measuring the levels of radiation that astronauts receive during missions is the easy part. “We can measure doses from exposure to radiation very effectively. The leap comes in how you predict the biological effects from the exposure to radiation,” says Peter Guida, a scientist at Brookhaven National Laboratory in Upton, New York. The number of astronauts is too limited to provide reliable information on the effects of space radiation. Only 24 of the men from the Apollo missions to the moon have been exposed to the unique radiation of outer space. While two of those 24 died of cancer in the decades following the missions, Cucinotta believes that it is “highly unlikely” that their cancers were related to their short, one-week journeys to the moon. Cucinotta and other scientists are following the effects of radiation in astronauts after six-month missions in low Earth orbit on the International Space Station. After two or three trips, astronauts usually reach NASA’s maximum acceptable exposure limit, based on the radiation levels that deposit in the badges they wear. By analyzing their blood samples after the missions, Cucinotta’s team found that DNA in blood cells from all 19 of the astronauts tested was damaged. It is too soon to tell if the damage is slight enough to be repaired or if it will have a deleterious effect. To get a firmer handle on the biological hazards of space radiation, researchers are studying the impact of X-rays and gamma rays on people on Earth, and the effect of space radiation on mice and human cells in a Petri dish. “Our goal of the next five to ten years is to bring those uncertainties down [through] basic research,” says Cucinotta. To do the kind of larger studies on space radiation that can yield useful information, many radiation biologists take their experiments to Brookhaven National Laboratory. There, NASA Space Radiation Laboratory operates one of the largest machines in the world that can simulate space radiation. It’s unfortunate to hear this, but when one thinks about it, it’s not at all surprising that DNA damage can result in space. Eventually it should be possible to devise a shielding mechanism. Russian Space Agency ROSCOSMOS made studies with Deuterium-depleted Water (DdW) and now considers to design a life support system generating Deuterium-free water to reduce the risk of cancer consequent to the extreme radiation exposure of Martian crew.